Oil, published in 1931, tells the story of oil production in the Caucasus at the time of the first Five Year Plan. The book describes a plot by European capitalists, bitter over their loss of control of the oil fields and envious of Soviet prosperity, to use a false media campaign to incite a war with the Soviet Union. These provocations galvanize the workers of Baku and Grozny, who resolve to work hard to fulfill the Five-Year Plan. The oil workers of Baku and Grozny and their children are shown celebrating how oil production has fulfilled the expectations of the First Five-Year plan in two and a half years and is on track to overtake production levels from capitalist countries. The rest of the book depicts how oil is extracted and refined into useful petroproducts. It places particular emphasis on how much of the technology is Soviet-made and how the Soviet Union is on track to no longer rely on foreign machinery imports. At the end of the book, Baku is reconstructed by the Soviet Union. Everything is progressing quickly and Soviet technology is predicted to surpass that of the United States. 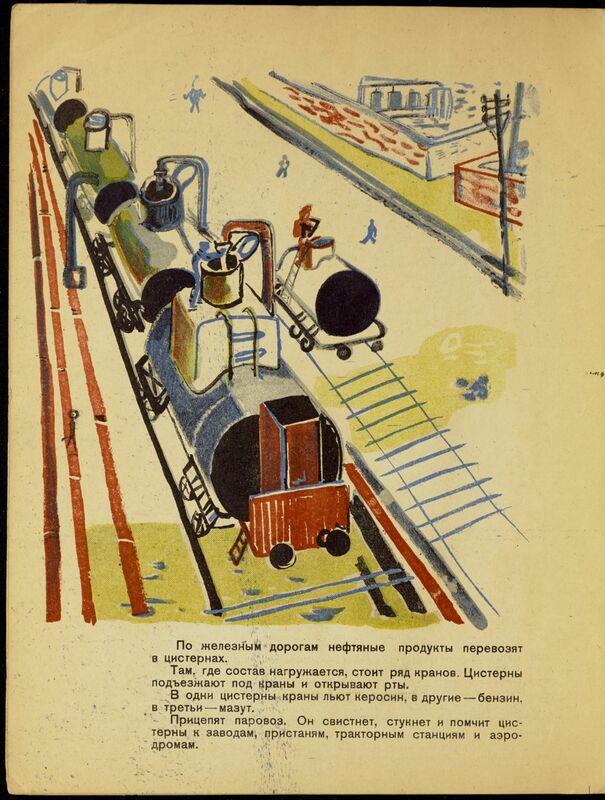 The book concludes by describing how the tremendous surplus of oil produced in the Caucasus is sold overseas to finance the import of machinery to strengthen Soviet industry. The book is written by Evgenii Khazin. Half Jewish and half Russian, Khazin grew up in an educated family in Uman, near modern-day Cherkassy. Khazin served in the White Army during the civil war, and lived in Moscow for the rest of his life, with the exception of two years in evacuation in Tashkent during the Second World War. Unsurprisingly given the tone of the book, Khazin primarily wrote novels and history and science education books aimed at an audience of children or young adults. Khazin’s sister, Nadezhda Yakovlevna Mandelshtam, also an author, was married to renowned Soviet poet Osip Mandelshtam. The illustrator, Nisson Abramovich Shifrin, was born into a merchant family in Kiev in 1892. He lived there until he moved to Moscow in 1922. After attending Jewish primary school, he studied at a Kiev art school under Ukrainian artists Oleksandr Murashko and Aleksandra Ekster. In Kiev in 1914, Shifrin helped a group of notable Futurists, including Rabinovich and Mayakovsky, stage a production of “Chateau de Fleurs.” While Shifrin is best known for his work on theater sets and costumes, he also worked extensively as a graphic designer and painter through the 1920s and into the early 1930s. His works included elements of Constructivism and emphasized the conventionality of decoration techniques. In 1925, he became involved with the OST (Society of Easel Painters). This organization, along with all other artistic groups, was dissolved by the government in 1932. However, Shifrin’s association with this group did not harm him; from 1935-1961, he was the main artist of the Central Theatre of the Soviet Army. He focused on the use of space and integrated painted scenery into the stage action. He later became a member of the Communist Party, and in 1958 was named the People’s Artist of the Russian Soviet Federative Socialist Republic. Oil was published by Molodaia Gvardiia, a publishing house whose name translates to Young Guard. Molodaia Gvardiia, which started publishing in 1922, was the publishing house for the Komsomol, a young people’s organization for children over 14; it was intended for children who had been Pioneers but aged out of the organization, which was intended for children 9-15. It published Soviet and foreign works, including works directed at younger audiences, as well as publicistic writings and literary criticism. In doing so, Molodaia Gvardiia aimed to influence the intellectual development of Soviet youth. Central to both the plot of Oil and the Soviet Union’s real-life oil production is Baku, the capital of Azerbaijan. Baku is a largely oil-based city and was one of the major industrial cities of the Soviet Union. It is located on a peninsula and is surrounded by the largest lake in the world, the Caspian Sea. The Russian Empire took monopolistic control of oil production in 1806, but then gave rights to production to select individuals under the otkupchina, or buy-off, system. However, this transition to oligopoly did not improve production techniques, which remained primitive given the lack of incentives to improve them. Until the second half of the 19th century, Baku was a deserted and forgotten place. However, as demand for oil grew following the Industrial Revolution, Baku started to develop into the jewel of the Russian Empire. From the 1870s to the First World War, Baku’s oil production prospered. By 1913, the Russian oil industry was booming, producing more than the United States, with Baku producing more than 95% Russia’s oil and more than 50% of the world’s oil. Advancements made in drilling practices, such as the cable-tool drilling method, allowed production to boom. By the start of the First World War, large foreign companies had largely consolidated control over the oil industry in Baku, with the Rothschild family, Royal Dutch, and the Nobel brothers as major players. This economic success was also accompanied by the rise of magnificent Baroque buildings in the primarily Muslim city. Baku became the largest city in the South Caucasus and a diverse hotbed of radical activity and labor organizing as the oil fields attracted workers and businessmen. Class divisions paralleled ethnic lines: foreign investors sat at the top of the pyramid, with Russian and Armenian merchants below them, and Muslim Azerbaijani industrial workers at the very bottom. The prosperity of Baku was interrupted by the Russian Revolution in 1917. After several years of conflict, the Soviet Union consolidated its control over Baku by 1920. However, oil production steadily throughout this period and reached a low in 1921. Following a successful scientific exchange with American oil fields, production stabilized in the late 1920s. Oil was published just as this renewed glut of production hit its stride and celebrated the accomplishments of the new regime in returning production to its former glory. The media campaign mentioned in the book and credited to Sir Henri Deterding, the chairman of the Royal Dutch oil company, has at least some basis in reality. Royal Dutch was one of the major foreign concerns involved in oil extraction in Baku, and after the Bolshevik takeover of Baku in 1920, Royal Dutch’s revenue saw a substantial decline. Deterding was married to a White Russian emigré and spent the years following the Russian Revolution criticizing the Soviet regime and predicting its downfall. Another location that was central to Soviet oil production was Grozny, the capital of Chechnya, a predominantly Muslim and historically rebellious province. By 1913, Grozny ranked second only to Baku in oil production in the Russian Empire. Expansion of the railway network to include Grozny and investment by Royal Dutch in modern production techniques and equipment led to extensive development of the Grozny oil fields starting in the 1890s, and Grozny was under Red Army control by 1920. Like many other industries, oil production in the Soviet Union was regulated by a five-year plan. The Soviet Union had a series of five-year plans, the first of which began in 1928 and ended in 1932--one year ahead of schedule--to improve and develop its economy, often through forced industrialization. Oil was included in these plans as a lucrative export to increase the Soviet Union’s presence as an energy exporter. The oil was also needed by the Soviet Union to fuel the new abundance of machinery that accompanied the advancement and growth in industry. As in the case of the actual first five-year plan, “over-fulfilling” the five-year plan by reaching the required production targets early was a common theme in this time period, both in official government communication and, often more sarcastically, in popular culture. Oil emphasizes the completion of the five-year plan in only 2.5 years, typifying this boastful language. Books describing the process of turning natural resources into usable products or giving details as to how prominent Soviet organizations worked were both common and popular. Similar works to Oil include N. Ostrovskii’s How the Steel Was Tempered (1934), a socialist-realist novel and fictionalized autobiography about Ostrovskii. In 1928, three years before the book’s publication, Vladimir Mayakovsky wrote a poem about Baku, touching on many of the same themes as this text - its oil and the envious foreigners who laid their eyes on its wealth. Given the author’s potential connection to poetic circles through his wife, it is not unreasonable that he might have been partially inspired by this work. A Russian-language version of the poem is accessible here. U.S. Cong., Congressional Research Service. (1983). (J. P. Hardt & D. Gold, Authors) [Cong. Rept. IB81025 from 97th Cong.]. Retrieved April 28, 2018, from https://www.everycrsreport.com/files/19830519_IB81025_b09360bfdfeb03b7a283e4313afdadc5e25d0eb1.pdf. Ioffe, I. A., & Petrova, N. K. (2003). "Molodaia gvardiia" (g. Krasnodon): Khudozhestvennyĭ vymysel i istoricheskai︠a︡ realʹnostʹ: Sbornik dokumentov i materialov. Moskva: Veche.